CD review: "Shaman, Jhankri & Nele: Music Healers of Indigenous Cultures"
This review first appeared in the September 12, 1997 issue of the North County Times. This is old-style multimedia: A book and CD about the use of music in traditional healing around the world. 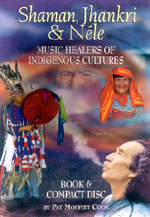 Written and recorded by Pat Moffitt Cook, "Shaman, Jhankri & Néle" has both a 96-page heavy-stock full-color book and a one-hour CD of various natural healers performing their traditional songs. This is not for doubting Thomases; Cook accepts without much question the legitimacy and effectiveness of folk healers. Given the nature of the project, that may be the right approach. This is about the healers, not a scientific exploration of whether their remedies work or not. Cook tells the story of each of the 18 healers heard on the CD, mostly staying out of the way and letting them speak in their own words. Numerous photos illustrate the ceremonies  from Korea to the Amazon, the Caribbean to India. The music is not for casual listening. Many of the traditions found here use chanting, dissonance and other non-Western approaches that may grate on American ears. But much of it is equally powerful and moving. Whether music can truly heal the body is a question for science to answer; certainly it is good for the soul.